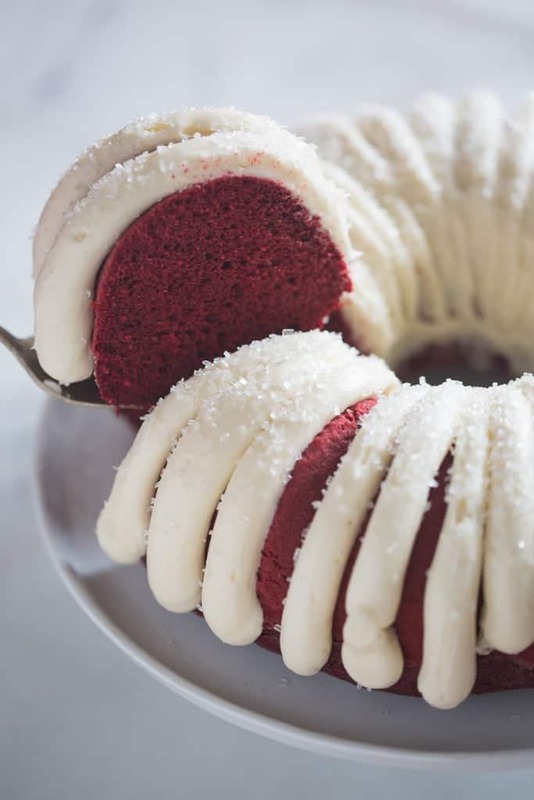 Moist and tender Red Velvet Bundt Cake with cream cheese frosting. Add some chocolate chips for a an even more delicious chocolate flavor. Nothing makes my mouth water like a gorgeous cake with homemade frosting! 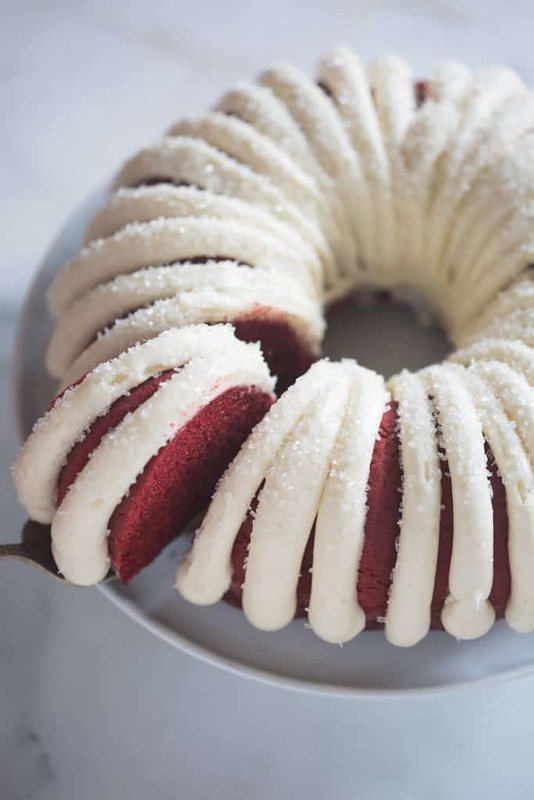 I love how easy bundt cakes are to frost and make pretty, with hardly any effort. 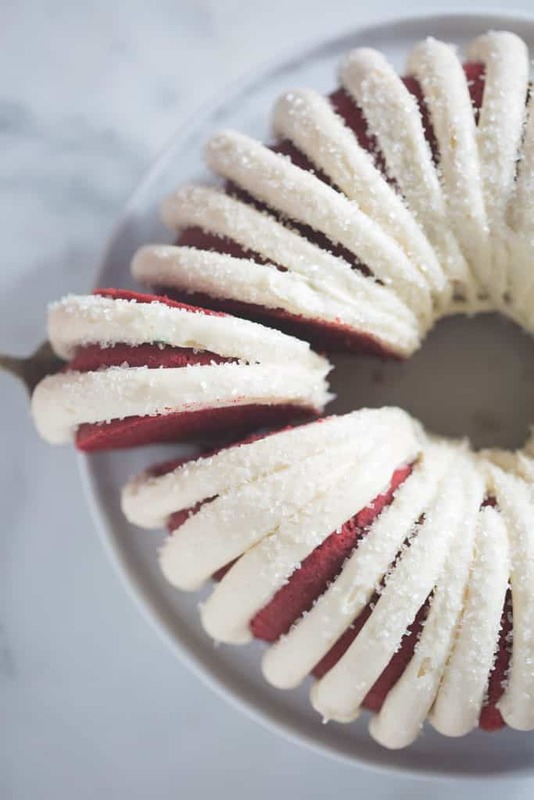 This homemade Red Velvet Bundt Cake is easy and delicious. It’s not dense and dry like bundt cakes can sometimes be. 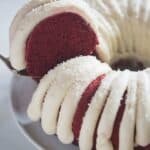 It’s moist and tender and I love how easy it is to frost when it’s from a bundt pan. 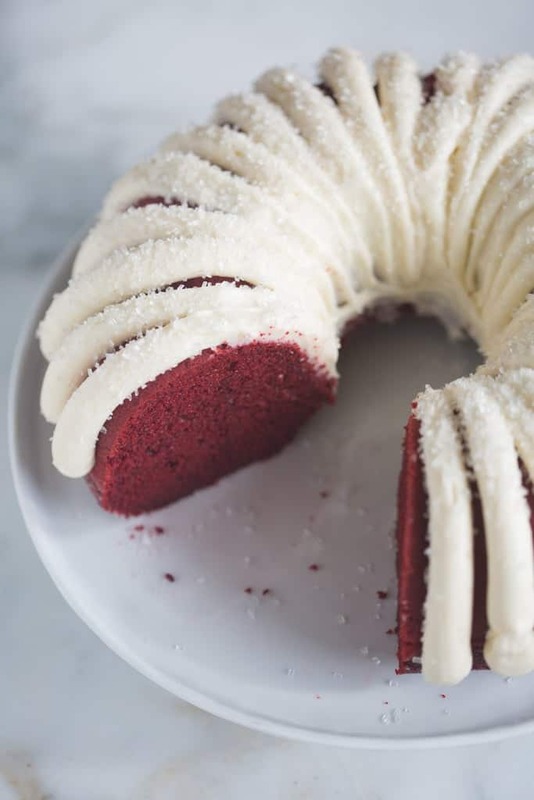 I fill a pastry bag, fitted with a coupler (no tip), with my favorite cream cheese frosting and simply pipe the frosting along the groves of the bundt cake. I added some crystal sprinkles to the frosting to make it extra beautiful. Super easy and delicious! Preheat oven to 350 degrees F. Butter and flour a bundt pan, set aside. To a mixing bowl add flour, baking soda, salt and cocoa powder and whisk well to combine. In another bowl add the sugar and butter and cream together with an electric mixer until pale and fluffy, 4-5 minutes. Add oil and mix. Add eggs and yolks, one at a time, mixing after each addition. Add vanilla, vinegar and red food coloring. Add about 1/3 of the flour mixture and stir to combine. Add half of the buttermilk and stir to combine. Repeat, alternately adding the flour and then buttermilk, ending with flour. Fold in chocolate chips, if using. Scrape down the sides and bottom of the bowl to make sure everything is incorporated. Pour batter into prepared bundt pan and smooth into an even layer. Bake in preheated oven for 40-55 minutes or until a toothpick inserted into the center of the cake comes out clean. Cool in cake pan for 10 minutes and then invert onto a wire cooling rack to cool completely. Once cool, frosting with cream cheese frosting. then run knife around edges of cake to loosen and invert onto wire racks to cool completely. Beat cream cheese and butter together until smooth. Add vanilla. Add powdered sugar, one cup at a time, until frosting has the consistency and taste you desire. Frosting can be made days in advance. Refrigerate in an airtight container. “Cream together” means to beat the mixture really well until light and fluffy. That term is used often in baking when talking about combining butter and sugar. Can this cake be made as a layer cake? Would I need to adjust the baking temperature and length of baking time? Can’t really say since I have not tried that. My guess is it will work. Same baking temperature and less cooking time than a bundt. Most likely @ 30 minutes baking time, just keep testing it. What kind of vinegar? White? Apple cider? I want to try this recipe but have never seen benefit in a cake before. This cake is on my Valentine’s Day menu ! One question: the frosting application is very pretty – any tips ? This is a perfect Valentine dessert! When I decorate the cake I use the coupler without a tip! I love this cake. I make nearly every cake in a tube pan, then cut in layers, usually three layers. The icing is a plenty. I get huge raves when I take it places. Always nice and moist. cuts well and moves into the layers easily.